Jack and Noah’s Big Day (234 pages) is available for purchase for $9.99 for paperback and $2.99 for Kindle. Jack and Noah's Big Election (515 pages) is available for $16.99 for paperback and $7.99 for Kindle. Paperbacks can be purchased online at Amazon or through CreateSpace. CreateSpace is a subsidiary of Amazon, and for whatever reason it pays a higher royalty to Jay than Amazon.com. So, if you're feeling charitable, buy the books at CreateSpace. Jack and Noah's Big Election is no longer available at The Bookworm, and The Bookworm's inventory of Jack and Noah's Big Day may be limited. At The Bookworm - This Omaha bookstore at 2501 S. 90th Street is possibly the most absolutely awesome local bookstore on the face of the earth, and Jay is not exaggerating even a little. Their children's department is stunning. Jack and Noah's Big Election is no longer available at The Bookworm, and The Bookworm's inventory of Jack and Noah's Big Day may be limited. In the neighborhood – If you live in Jay’s Omaha neighborhood, you can buy a copy directly from him. This is also a good option if you're buying 10 or more copies for a school. He’ll even autograph the book unless you think it will hurt the resale value. 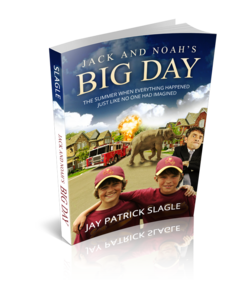 School fundraisers - If your school or PTO is willing to coordinate the promotion and sale of Jack and Noah's Big Day, Jay will return a portion of the proceeds to the school/PTO. E-mail Jay at jay@jayslagle.com for more information. If you sell a lot of books, Jay will visit your school for a few hours and do whatever you want, as long as it doesn't involve cleaning. He doesn't do cleaning. In Jack’s backpack – Jay wrote two books about his son. Jack is required to have a copy of both books with him at all times. I'm serious. You can also check out Jack and Noah's Big Day at the libraries listed below. We hope that Big Election will also be added to the libraries this fall. At an Omaha Public Library – Three copies are available at their on-line reservations system. If you're tired of waiting for your copy, you can always ask a librarian if they'll buy 755 more copies. At the St. Margaret Mary School library – This library has pretty high standards, but the library has purchased two copies from The Bookworm, and Jay even threw in a free copy. This school is the first place that the entire book was read out loud. Yeah, there ought to be a monument there or something. At the Dundee elementary school library - Our good friend Emma, the little sister of Delaney (who is featured in both books), has donated a copy of Jack and Noah's Big Day to the school library. Of course, it's possible the library has thrown it away. However, I doubt it. Emma's a pretty persuasive kind of girl. Do you want to help the Jack and Noah's series be successful so Jay writes more books? Tell your friends about the books in person, by e-mail and on Facebook. Create Vine videos. Tweet about it. Tell the teachers at your school to read it to their classrooms. Once you or your child have read the books, you can help Jay by reviewing the book at www.goodreads.com and www.amazon.com. He loves reviews.